A new discovery, announced today in the journal eLife , shows the perfectly preserved 3D fossilised heart in a 113-119 million-year-old fish from Brazil called Rhacolepis. The well-preserved fishes from the 113-119 million-year-old Santana Formation of Brazil were among the first vertebrate fossils to show evidence of preserved soft tissues. These include parts of stomachs and bands of muscles. The Rhacolepis heart was digitally restored by tomography and from images studied in cross-sections through the rock. It shows clear detail of the conus arteriosus , or bulb at the top of the heart, which has a pattern of five rows of valves inside it. Some, such as the African reedfish , a very basal member of the ray-finned fishes, has nine rows of valves. 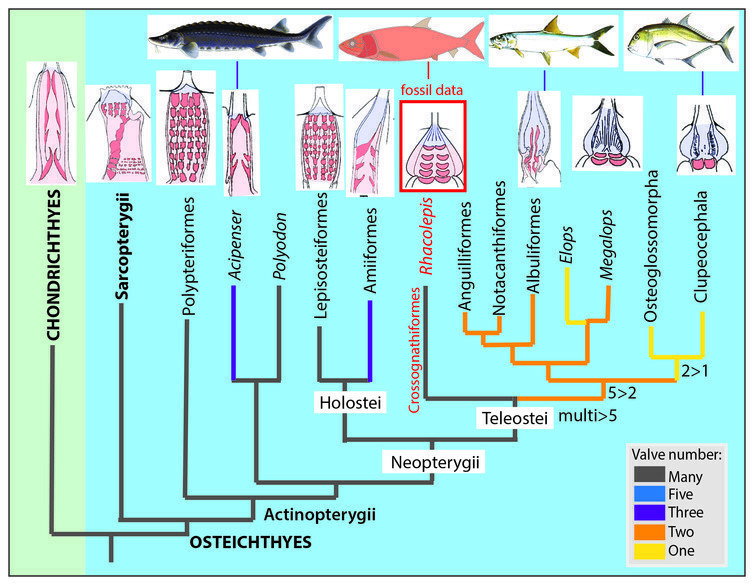 But the modern most diverse group of ray-fins, the teleosts , have just a single outflow valve in the heart. In teleosts another structure, the bulbus arteriosus , prevails over the conus arteriosus to dominate outflow of blood from the heart. Enter our fossil, Rhacolepis, a fish belonging to an entirely extinct family, the Pachyrhizodontidae, named after the extinct fish Pachyrhizodus . This is a group placed close to the base of the teleosts.